LONDON, Ont. — A student in London, Ont. is crying foul after his high school barred him from carrying a controversial flag at a multicultural assembly. Kumar Makandu, a Grade 12 student at Central secondary school, had carried a Tamil flag at the annual assembly for the past two years but was told by administration leading up to the event on Friday that he couldn’t showcase the flag. For Tamils, an ethnic group living primarily in northeast Sri Lanka, the flag is a national symbol representing the movement to create an independent state. It depicts a tiger jumping through a circle of bullets — though Makandu says it’s the sun — with two crossed bayonets. Central principal Jim Robertson decided only the flags from internationally recognized countries would be included in the assembly after a student last year mistakenly thought the Tamil flag was connected to the Liberation Tigers of Tamil Eelam, a militant group that fought the Sri Lankan military in a bloody civil war from 1983 to 2009. The group was added to Canada’s official list of terrorist organizations in 2006. 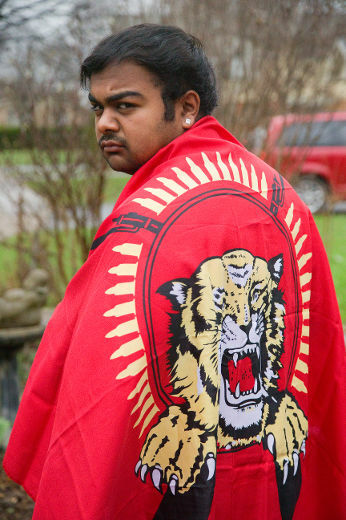 But Makandu said there’s no connection between the Tamil flag to the Liberation Tigers, an organization the Canadian government put on its terrorism list in 2006. If I can’t even bring my flag up, how can I share my culture?” said Makandu, adding he spoke to many of his fellow students prior to the assembly and they told him they had no problem with him carrying the flag. Makandu showed up for the assembly wearing a shirt depicting the Tamil flag, but a teacher promptly asked him to take it off. He did so, not wanting to create trouble, and walked under the Sri Lankan flag at the assembly. It’s pretty upsetting that I can’t represent my culture in a multicultural country like Canada where we embrace other cultures,” he said. Ungrateful foreigners in Sri Lanka. to live or buy land in the north and east. Tamils in jaffna brought there by the dutch to work in tobacco plantations. Tamils in upcountry were brought by the british to work in tea plantations. If you had kingdoms, where are the remains of those? Can you find a tamil brick older than 400 years? foreigners go to Anuradhapura or Polonnaruwa you can see how old kingdoms look like. to the country they were born while sucking all the blood from the country. Why don’t you leave for where your heart is? Tn. Even in tn they don’t get this much facilities. Still not happy. Traitors can study in Galle to be a doctor/engineer etc. world you get these sort of benefits you traitors? These traitors are nothing but a cancer to any society! Tamils ARE NOT “an ethnic group living primarily in northeast Sri Lanka”- they are an ethnic group primarily native to the Tamil Nadu province of INDIA. They are aliens in Sri Lanka- and they behave like aliens in Sri Lanka. There are 78m Tamils in Tamil nadu and only 2m in Sri Lanka. Also, there is no province called the ‘Northeast” province in Sri Lanka. There is the North and there is the East- totally separate provinces – both, parts of Sri Lanka where the primary inhabitants are Sinhala. The Tamils and their Victim Mentality will never go away. There is no Tamil flag in Sri Lanka. Perhaps, in Tamil Nadu but not in Sri Lanka. Correct me if I am wrong.